“TED Talks Storytelling” shows you how to improve your storytelling skills. It offers 23 storytelling techniques to be captivating and make a great delivery. 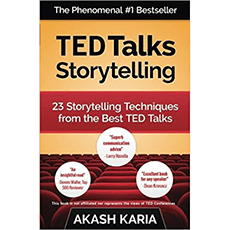 Akash Karia has studied more than 200 of the best TED talks and analyzed their structure, message, and delivery. Like some of the best TED speakers, this book explains how to craft and present stories without appearing to lecture your audience.